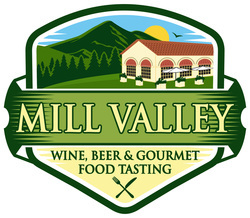 ﻿On Sunday, June 5, 2016, Mill Valley will host the 35th Annual Mill Valley Wine, Beer and Gourmet Food Tasting, with proceeds going to the Mill Valley Chamber of Commerce and Kiddo!, the Mill Valley Schools Community Foundation. Sponsored by Mill Valley Market since 1981, this special North Bay event brings together all the best aspects of California living into one exciting afternoon set against the backdrop of beautiful Mill Valley. The Mill Valley Wine & Gourmet Food Tasting features wine from more than 60 premium wineries, beer from 10 breweries and food from more than 30 gourmet food purveyors as well as 12 local restaurants and chefs. Known for a wide selection of hard to find wines, this event is not to be missed by anyone who is a fan of finely crafted beverages and foods. The event is produced by Steven Restivo Event Services. The Wine & Gourmet event includes both Kiddo!, the non-profit Mill Valley Schools Community Foundation, as well as the Mill Valley Chamber of Commerce as its beneficiaries.